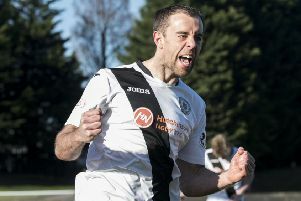 The former Dundee United and Aberdeen frontman’s spot kick five minutes into the second half following a foul by Liam Henderson ensured the Bully Wee leapfrogged their opponents into second – a point better off – while league leaders Peterhead stuck to their end of the bargain with a 1-0 victory over Elgin City. The results now leave City third in the table, a position they haven’t found themselves in since the end of August. In truth, the Citizens were second best for the majority of contest despite the hosts having to play out the final 26 minutes with ten men following defender Tom Lang’s sending off for picking up two yellow cards in quick succession. McDonaugh was also unimpressed with referee Lloyd Wilson’s decision to stop play to dismiss Lang just as winger Graham Taylor was advancing in on goal with only goalkeeper Blair Currie to beat. The former Falkirk assistant is refusing to panic, though, pointing out that the top two still have to visit Ainslie Park before the season is out. The club also has the opportunity to regain second spot when struggling Berwick Rangers visit the Capital tomorrow night. “I’m really disappointed as I just don’t feel we did ourselves justice out there. I think Clyde were the better team in the first half but the game was settled on two big decisions,” McDonaugh said. “I feel it was a penalty so I don’t really have too many complaints about that. But the one when we’re through on goal, I appreciate it’s a difficult decision for the referee but I’d rather we scored than play against ten men. “He explained afterwards that he stopped it because we’d had our shot on goal but that wasn’t the case. He’d already stopped play. I understand his explanation that because it was a sending off he had to stop it but it’s really frustrating when you’re in that position. It’s kind of cost us. “That said, we didn’t work the ball nearly enough and that’s not like us. We didn’t play well enough when they went down to ten men. We’ll learn from it, both the players and the staff and try and improve. McDonaugh continued: “The players have got to remember where they’ve come from. If we can win our last ten games then we’ll still have a good chance of winning the league. Clyde made their intentions known from the off when Christopher McStay’s header came back off goalkeeper Callum Antell’s right-hand post following former Hibs midfielder John Rankin’s cross. Despite some intense pressure from the home men, the visitors’ rearguard weathered the storm to see the half out. However, Goodwillie drew a foul from Henderson five minutes after the restart and although it looked contentious, the penalty was awarded. The striker picked himself up and lifted the ball over Antell from 12 yards. 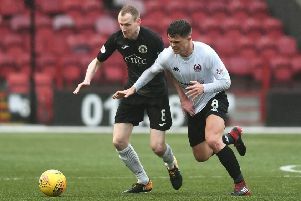 City’s best opportunity to draw level saw Taylor through on goal after Lang had scythed down Scott Shepherd but were left to rue the referee’s decision to stop play and send off the Clyde centre half. Clyde: Currie, Stewart, McNiff, Lang, Rumsby, Grant, Duffie (Banks 46), McStay, Goodwillie, Rankin, Lamont. Subs: Hughes, Lyon, Boyle, Love. Edinburgh City: Antell, Thomson, McIntyre, L Henderson, Black, Balatoni, Laird, Walker (Smith 76), B Henderson, Taylor (Watson 83), Shepherd (Diver 83). Subs: Morton, Rodger, Donaldson, Breen.